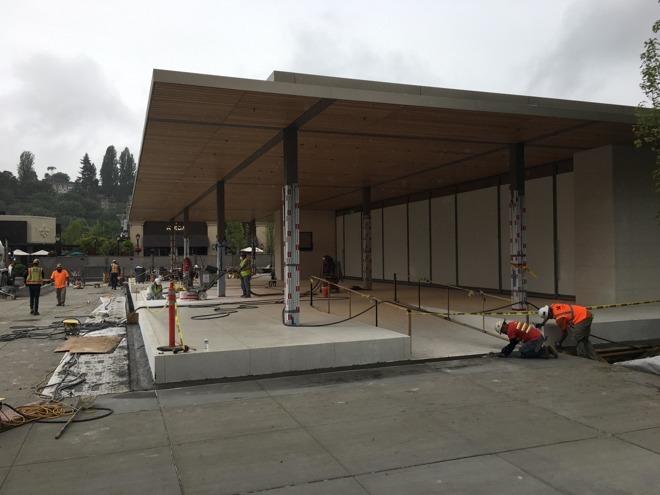 The replacement for Apple's current University Village outlet in Seattle is finally coming close to completion, photos and video show, although an opening date has yet to be set. The future location has been under construction for over a year, and should occupy some 11,600 square feet, though only 6,300 of that will be visible to shoppers. A photo shared on Reddit — and video shot with Snapchat —shows many tiles and ceiling panels put in place, and the biggest structual work already finished. The ceiling will apparently use wooden panels and track lighting, a carry over from other recent stores like Michigan Avenue in Chicago. Since the launch of the Apple Watch in 2015, Apple has adopted a more stylish, fashion-oriented aesthetic for new and renovated stores, for instance adding indoor trees, wooden shelves, and oversized video displays. The company has simultaneously been working to expand or renovate older U.S. stores, some of which predate the launch of the original iPhone in 2007. That includes University Village, which has been operating since 2003.